I’ve been exploring WordPress a bit, creating extra pages and setting up new features. While I was playing around, I set up a page with the 20 most recent items that I’ve added to my wish list at wists. The reason I’m sharing is not because I’m trying to surreptitiously ask for things – Honest! I just think that the items are cute, and I wanted to share. I’ve had the wish list on the side bar for a long time now, but it’s kind of tucked away towards the bottom. I’ve been writing mostly about the things I do and make, but do you also want to see posts about items that catch my eye? I sometimes feel like there are so many design blogs that do that sort of thing, with more frequency and regularity, and so maybe it isn’t necessary here. On the other hand, sometimes I want to share the cute shoes, the furniture, the art, the jewelry, the decorative items, and the pillows I like. Because I think you might like those things too. Oh definitely Yay!!! I love your style!! If sounds fun to you then I’d say go for it! I did also like your idea before of helping people out with their own design. I think there is a niche for affordable shelter styling and you’ve done a great job at that with your own home. You definitely should share the cute and unique things you find! A lot of other design blogs fall short by just objectively posting about something cool or interesting. But you do a fantastic job of describing why YOU like/want something, like with the bench in the last post. Anyone could have posted “look at this bench, it’s neat! I would like one for my home,” but only you could describe how it inspired you to makeover the bench you dug up from your basement. I check in on your blog every now and then and I just had to tell you how enamored I am with your new layout! I just can’t stop looking at it- so, so darling! I like what you pick out. I think it’d also be interesting to see websites and other sorts of places you like to visit and get inspiration, or someone with cool online items you are particularly drawn to. Absolutely! You have a great sense of style. I’m with Elissa – the key to posting cool stuff and still making it interesting is to contextualize the stuff with your experience/perspective/personality. By the way, I think you just kind of changed my life – I had no idea that Wist existed. Now that I do – oooh I can’t wait to begin building. Definitely yay! Pleease? It would most certainly make my day! Absolutely share what you love! There really are tons of blogs that do that, and I really enjoy it! I love your blog because it inspires me to improve my home, and myself. I like your ideas because most can be “mimicked” on a budget. Your shoe post, for example, was helpful to me, because they are affordable. I am so happy people like you exist. Thank you for sharing your wit and impeccable taste. Very Cool! I want the Table Runner! I have a pillow that matches it! BTW, love what you do!!!! I love seeing peoples wists. It exposes mr to things I might not have come across other wise. I say go for it! And I was going to call you today and ask about that widget for “favorite books” that we talked about a while back, and I see you have one! Waaah! Let me guess: only a wordpress thing? I. Am. So. Jealous. I wouldn’t mind a little expansion on topics, but I would rather it was still related to home design/decor. Oh, one more thing! I agree with Lili that you may want to take on a few reader questions or projects every now and them. I have one for you right now! Any tips on grouping items r filling in the room with the final layers of accessories? Here is where I falter. I am strictly big picture. Placing vases, frames, and other decorative items completely alludes me–to the point I want to buy a book on the subject! haha Jules! my suggestion was purely for selfish reasons too! I think I’d like it more as what you’ve done with wists – available but not the main thing. 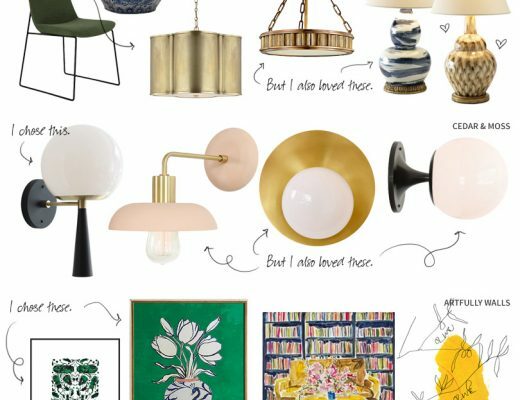 I really like seeing the process and progress of what you make in your home, but you’re right – there are a lot of design blogs out there. I love your blog, I found it when I did a search for Eames molded plastic chair :) I’d love to see stuff you’ve got your eye on! Yes, I always see things that I wish for and things that I see that I can make or that inspire me to make my life more artfully complete. yes! I love your blog/style.. you are so kind to share everything. I would love to see what catches your eye but please don’t ever abandon showing us so much of your personal space. What I love most about your blog is that I get to see the changes you make to your own beautiful home. By-the-way I love looking at your blog, it keeps me sane while I’m at work in my drab cubicle. I’m glad so many of you are receptive to the idea! To clarify, this would be in addition to what I normally write about (not a replacement). I’ll still be adding items to wish list page through wists, but now I’ll also post about some of the items a bit more. Yay! I love your website!! Your pink office inspired me so much that I made mine pink as well. I think you are stylish and refreshing. Please keep doing what you’re doing. I love this idea! I am going to make one of my own, I think. Also, love the new blog layout, I’ve been a reader/lurker for a few months! I love the WIST…I also love lots of the items on your WIST! I just may have to put together a WIST of my own. Thanks for sharing.